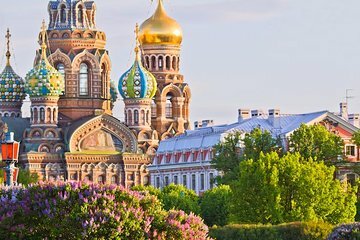 This 3-day tour of St. Petersburg includes transport, lunches, and all entrance fees for places shown on the below itinerary, so you can relax and enjoy your time exploring what the city has to offer. Go to the famous Hermitage and the Faberge Museum to learn about Russia’s history. Along the three days, see Yusupov Palace, St. Isaac’s Catherdral, Peterhof Palace and Garden (Petrodvorets), the Church of the Saviour on Spilled Blood, and Catherine Palace and Park. What a wonderful Tour, absolutely amazing time. We were so well looked after, the sights we saw were amazing, and so well organised, our guide and driver looked after us so well, never had a moments worry. Would highly recommend this tour company, it far exceeded anything the cruise ship had to offer and at a fraction of the cost. All the paperwork, visa's etc were excellent and their was absolutely no hassle with the immigration, straight through each day and returned to the ship on time every time. No waiting in Queues, really well organised and great fun. Our tour was absolutely wonderful. Boris, our tour guide was delightful and our group were amazed by his unbelievable knowledge. He even timed the day so that we were able to beat the crowds and see so much. We all felt very privileged to have him show us around beautiful St Petersburg. Having booked with Viator, we were put with SPB Tours who organise excursions in St. Petersburg and other European cities. There were 14 of us in a minibus. The same minibus and driver stayed with us for the three days. Our guide, Misha, was a native of St. Petersburg. Her love of the city and its art was clear through the enthusiasm she showed for all the places we visited. As well as speaking excellent English, she was a warm and friendly person and made everyone feel welcome. We packed a lot into three days but never felt rushed. The second day involved an early start so that we could visit the Peterhof Palace before the crowds arrived and SPB were able to get us into the Hermitage on the day it is normally closed in order to avoid the worst congestion. We were scheduled to visit the Russian Museum on the final day but as most of the group had understood the tour included the Faberge Museum, the company changed the itinerary to make the substitution. Nothing was too much trouble. We felt the tour was very good value, considering it included three very good lunches, wi-fi, bottled water every day, all admissions and photo permits, a boat ride and a ride on the Underground, plus the expertise of Misha and the services of the driver, who never kept us waiting. I would heartily recommend this tour. It was a highlight of the cruise. Our guide, Dasha was Russian yet spoke English fluently. This tour was soo much more than I expected. Everything on the itinerary was covered and then some. Dasha was very knowledgeable about all aspects of every museum and palace we entered. And on the bus, she continually told us about places we passed and she also gave us a complete history of Russian culture. She made sure we had time to shop and that there were always clean bathroom facilities available. Our driver was Andre, and he was very helpful also, He would help you get off the bus. One day he brought extra umbrellas for us to use in the morning drizzle. And after the rain stopped, he wiped the bus windows so we could take clear pictures again! This tour gave us so much insight into Russian life today and in the past. Thanks for making our trip to Russia unforgettable!!! Once we had cleared Russian immigration, we could see the SPB tour guides, who were conducting our Viator tour, by the cruise terminal exit. SPB is a local Russian company that specialises in tours of St. Petersburg. Our tour guide was Dascha and our driver Dimitri, and on arrival at the minibus, we were given water bottles each, foldaway ponchos, maps and audio guides. The SPB minibus tours cater for a maximum of 16, and there were 13 in our group. Dascha was excellent throughout, being fluent in English and Russian, and over the course of the 3-day tour, as well as describing the sights, told us a lot about the Russian way of life, and how they viewed other countries. Also, Dascha was in constant contact with other tour groups, and often swapped our itinerary to avoid queues and delays. We were also in constant contact with her via the audio guides. I wont go into the detail of each sight, as these can easily be investigated on google, but just list what we saw. a On a metro ride from the deepest station 300 foot underground beautiful stations and cheap frequent trains. a On a canal boat trip. On all 3 days, we ate in very good restaurants, serving excellent Russian meals one with complimentary vodka. All in all, an excellent 3 day tour, with a brilliant guide and driver, in which we saw all the main sights, and learnt a lot about Russian life. Would recommend an independent small group tour, over the cruise ship large bus tours. We had an excellent guide, Elene, and an english speaking driver, Alexis. Elene's knowledge of St Petersburg was phenomenal and the tour itinerary took us to all the right places at the right time to avoid big queues. Overall, a superb well organised tour. The 3-Day Deluxe Tour with Canal Ride met all of our expectations. Our guide Lena was a native of St. Petersburg and it was obvious she had studied all of the attractions we went to in great detail. She was funny and worked hard to make sure all of our expectations were met. Our driver, Vladimir, did a great job navigating the busy streets of St. Petersburg. On our last day as we arrived at the terminal, the President of the touring company was greeting all of her buses as they returned, just to check to make sure everything had gone well. All fourteen members in my group indicated the tour was well done. Myself my husband and two friends did a 3day tour on the 27th 28th and 29th May 2017. If ever you have the chance to visit St Petersburgh I recommend you do not use the ships tours as Viator are cheaper and it seems we had a far better tour. The guide Mesha was fantastic how she remembered all the information I do not know and her English was very very good, you could tell she was very proud of her city and loved her job. The sites we visited just got better by the day, it was a very intence and tiring 3 days but well worth it . We had 3 meals included in our tour and I must admit I was very dubious and did not know what to expect but was very surprised all three were very nice. We travelled in a mini bus which was very easy to get in and out of and we were only a party of 12 and we all given ear peices so it made it very easy to hear Mesha were ever she was and no one got lost. So if you are thiking of touring any of the cities Viator do I would thoroughly recommend them and we did not have to worry about the Russian expensive visa. This was a busy three days! I wanted to see all the highlights of St Petersburg and we did! There was a mix up on day 3. Our tour guide, Sophia was going to take us to the Museum of Russian Art or History but we still hadn't visited the Faberge Museum. Fortunately, a woman in our tour group had the agreed upon itinerary with them. During lunch, Sophia worked with her boss to arrange the visit to the Faberge Museum. We were so grateful for the extra effort she put forth to make this happen. I must admit that I had had enough of regular museums by the end of the tour. The other 13 in the group felt the same way. None of us wanted to go to the Russian Museum. The Faberge Museum really isn't a museum. It's very small and can be seen in about 30 minutes. It does have some beautiful pieces and I am glad I can say I went there but actually, it's disappointing. Sophia was an ok tour guide. I wish her English was a bit better. Also, don't expect any negative comments regarding Russia or the old Soviet Union. Most questions about housing, schooling, wages, availability to travel, grocery shopping, etc were answered in a neutral, politically correct manner. I'm glad we did this tour but once was enough for me.